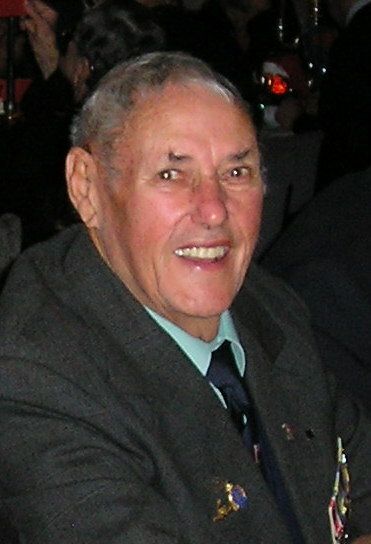 35220 Lt Col Evard Dennis Meredith CAPE, (27 Nov 33 – 8 Jun 13), Royal Australian Artillery, was the first BC of 106 Fd Bty RAA which was formed in 1966 and went to South Vietnam in Apr 67. Bill was feeling better every day. Then he had visitors . . . .
Pappy Patchin writes . . .
How good to get the newsletter. How sad to read the names of some of our most famed members from World War II and Korea I have read and heard about, to those of my time with 161 Btry with the 173d. Last Post continues to echo and we will remember them. Bill Giles is in Middlemore Hospital, Auckland, with a broken hip after a fall. Jerry Meyer visited him yesterday and says he is in good spirits. He may have an operation today to fix the break but will be in hospital for a while until it mends. Fraternal Gunners Day greetings to all in the Royal Regiment of New Zealand Artillery, those serving and those who have served the guns. Congratulations on your Anniversary Day. 16 Fd Regt are currently planning a rugby league trip to Australia in October 2013. They will play 6RAR and 1 Fd Regt- a Long Tan Cup is the prize. Bill is currently in Middlemore Hospital (Ward 10) with a broken hip after a fall at home on Wednesday afternoon. Gents, during our month long trip in SW WA we had dinner with Billy and his partner Fleur in Esperance where he resides. He is well, owning a business comprising mining based assets in the East WA Goldfields area and doing very well for himself.